This product is not sold online. Call 1(800) 542-0111 for discounted prices on Quantity & Freight. In order to get you the best possible price for this purchase inquiry and shipping on this item please fill out the short form below or you may email us at atyourservice@norvabarbersupply.com Otherwise please call our office 757-583-7669 - 8:30 am - 5:00 pm EST. The Norva Constantine is a retro inspired barber chair. It features spacious seating with extra thick seat and back cushions offering great comfort for clients. It comes with traditional towel bracket and scissors hook . The back is reclinable with an adjustable headrest. 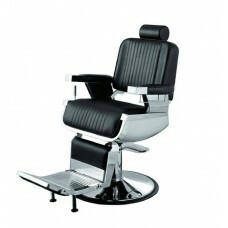 It comes with a Heavy duty hydraulic pump & Stainless reclining handle and footrest. The Norva Constantine has a flip back footrest for comfort giving it a vintage barber chair look.The footrest is equiped with an anti-tip pedestal safety feature. The width of the seat cushion is 19" & the width between the arm rest is 21 1/2''. The hydraulic pump has a 7'' travel. Each chair is covered by a 1 year Limited Mfg warranty & 3 years in total warranty on the hydraulic pump. Additional shipping charges will apply for chairs & furniture. Call Mike on 1(800)542-0111 for discounted prices on quantity & freight.